Whether you’re making Easter cupcakes or anytime carrot cake cupcakes, candy-covered sunflower seeds make for cute, quick “carrots.” Add some leaves and you’re ready for the Easter Bunny! What You Need: 1 cupcake; white frosting; orange candy-covered sunflower seeds; icing tinted green or gel or writing icing in a tube; #3 metal tip with pastry bag and coupler (or just use tubed icing). How to Make It: Frost cupcake white. Place candy-covered sunflower seeds all over the top. The pointy ends are the tips of the carrots. Add bit of green icing to wide end of each seed to make carrot. 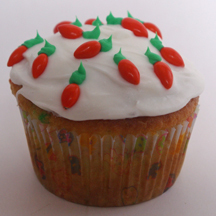 This entry was posted on Tuesday, March 3rd, 2009 at 12:32 pm	and is filed under Easter cupcakes. You can follow any responses to this entry through the RSS 2.0 feed. Responses are currently closed, but you can trackback from your own site.